It’s probably fair to say non-US airlines around the world offer better service than US carriers flying internationally. At least that is the general sentiment from those that have flown both. By association you’d then think that the domestic product of these foreign airlines would therefore be equally impressive. But is this assumption true? In the US complaints typically outnumber compliments when it comes to food, comfort and treatment for both economy and premium domestic travelers. Maybe this is just typical consumer never satisfied attitudes. Maybe they are right. Having flown Turkish Airlines on a regional flight a few months back I was aware of the seating. European business class seats are not. They are economy seats and your business class fare means the middle seat is blocked so you have a little more room. And maybe you’ll get a meal. From my limited experience flying business class over there, that’s about it. In the US I’ve taken 2 hour flights in lie flat first class suites on wide body aircraft many times. (UA 777 ORD-DEN 2hours). And I’ve written about how prime routes like Chicago to New York are being flown by tiny regional aircraft so I know the difference in service between various aircraft. On an A320 a domestic first/business class seat typically is pretty good. Food might be a different story. So to US domestic business class customers who aren’t satisfied: Stop complaining! Here’s why. This Austrian Airlines flight was part of my journey to fly Austrian, SAS and Air China to Seoul. Vienna to Copenhagen is a little over an hour. So as horrid as I may make this sound, it’s not a big deal. In fact I was amused. A nice cup of European coffee at the gate started the trip. Vienna airport was quite busy this morning, my flight was a 7:15AM departure to Kopenhagen. The aircraft to CPH was an Airbus A320. On this grey overcast morning during the taxi way out I got a photo of an Austrian retro-livery A320. Here is a photo of the business, err economy, ahh business class seat. Not much room to maneuver but I got a photo from the back. Notice the reading materials available. All complaints aside, it was a nice seat, for economy. Breakfast was served. Having had a couple meals on Austrian a few days earlier that were delicious, with this memory and expectation I passed on some of those tasty pastries within reach when I bought my coffee at the gate. Sometimes we make bad decisions. Breakfast was served with a tiny cup of coffee, fortunately there wasn't any turbulence this morning. The safer spot is to sit in row 1! Oh, they block the seats in row 1. Now I know why. 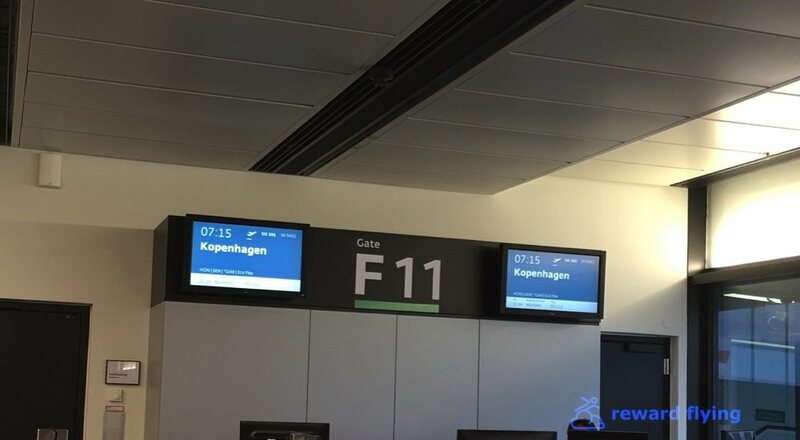 Before getting kicked again I was in Denmark.